It was supposed to be rivalry week. However, it turned into union Saturday at halftime of the Southern-Grambling State Bayou Classic in New Orleans. 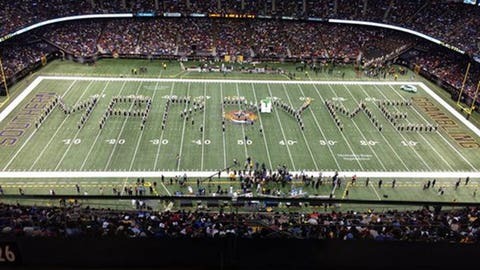 The famed Southern band helped alumnus Calvin Mills Jr. pull off a stellar marriage proposal. With the band on the field, an enormous gift box rolled out and Ajaya Ramsey, the 12-year-old daughter of Brittany Ramsey, popped out of it and handed a jewelry box to Mills in front of a crowd of 41,000. Sticking with the football theme, Ajaya handed off the ring to Mills, who got down on one knee and popped the question to Brittany but only after first asking Ajaya if she would be his daughter. The ring was 2.62 carats. Mills was a three-time Southern University champion forward from 1997-99. He currently is president of a technology company. The stunt had a simple beginning; Mills mentioned what he had planned when completing the phone order. Lisa Bissell, president of the company, took it from there. "We then put our team to work on devising a Superdome stunt and decided to build a gigantic gift box for Calvin, which we viewed as a prime opportunity for publicity for Pure Grown Diamonds," Bissell told NOLA.com. "Where else are you going to find an audience of this many people, under one roof, in one place, at one time, like we have on Saturday at the Superdome."